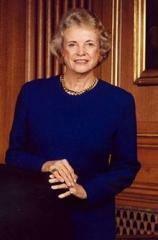 Sandra Day O’Connor (Retired), Associate Justice, was born in El Paso, Texas, March 26, 1930. As a child, she rode and hunted, learned about farming and how to raise cattle, and got to know and appreciate the wide variety of wild, indigenous animals around her family’s ranch. Young Sandra really did have a pet bobcat, tortoise, and a darling dog named Susie who became her most cherished animal friend. Justice O’Connor received her B.A. and LL.B. from Stanford University. She married John Jay O’Connor III in 1952. President Reagan nominated her as an Associate Justice of the Supreme Court, and she took her seat as the first female Justice on September 25, 1981. Justice O’Connor retired from the Supreme Court on January 31, 2006. She has three sons --- Scott, Brian and Jay --- and resides in Phoenix, AZ. The road to today's modern court, Justice Sandra Day O'Connor writes, was one fraught with change, upheaval and contingency for most of our nation's history. So much of what we take for granted was once steeped in uncertainty. Here, Justice O'Connor sheds light on the people and transformations that took us from John Jay to John Roberts, from an erratic young court to the incredible institution that endures today.